As industries strive to improve control of processes, the quality of the measurement of that process is often overlooked; but good quality measurement is the first requirement of any control scheme, new or old. No matter how good your DCS, PLC, SCADA, or cloudbased data collection is, if you do not have accurate reliable process data, it does not matter. Nowhere is that more true than with liquid tank level measurement. Incorrect levels can introduce a host of problems that can affect your plant’s bottom line. If the reading is too high, the tank could overflow, leading to lost product, a safety hazard, or an environmental problem (or all three). If the reading is too low, the pumps could burn out. If the reading is just wrong, inventory control could be incorrect. Getting an accurate, reliable level measurement to the controller quickly is the goal of any good level measurement device. There are many different technologies available, but the most widely employed technology is differential pressure. Using a differential pressure transmitter to measure level employs an easy to understand principle, is field-proven, and can have cost advantages over other technologies. But, differential pressure level measurement has an enemy – temperature. Temperature can have a negative effect on the accuracy of the level measurement. This article will cover the why temperature has the effect and how this effect can be reduced. Differential pressure level measurement works by inferring the level in the tank from the differential pressure measured. The media being measured must have a constant density (Specific Gravity) to use the differential pressure method. The differential pressure transmitter is installed at the bottom of the tank whose level is to be measured. The liquid in the tank creates pressure that is higher than the reference pressure. If the transmitter uses an analog 4 to 20 mA signal, it will be set up so that the 4 mA signal will correspond to the pressure when the tank is empty (0% full) and the 20 mA signal will correspond to the pressure when the tank is full (100% full). The reference pressure mentioned can be different based on the tank design. An ‘open’ tank is vented to atmosphere and uses atmospheric pressure as the reference. In a ‘closed tank,’ or pressurized tank, the reference is the pressure that is at the top tank. On the closed tank, the low pressure side of the transmitter is connected to the top of the tank. There are several different ways to make this connection. There are ‘wet’ legs, ‘dry’ legs, etc. ; but one of the more common is to use a remote seal attached via capillaries. The capillaries are filled with a fluid that transfers the pressure to the transmitter sensor. This type of connection eliminates maintenance issues encountered with the other connection types mentioned. In this type of installation, the differential pressure transmitter is measuring the pressure of media in the tank, the pressure in the top of the tank, and the head pressure generated by the fill fluid in the capillary. (Basically, the head pressure generated by the fill fluid is just like the transmitter measuring the level in a tank, but the tank is always at 100% full.) All smart pressure transmitters on the market today can account for the capillary head pressure. However, this fill fluid, being a very small amount and being in a very long tube, can be affected by temperature. Like all liquids, a change in temperature can cause a change in density (SG) causing the head pressure measured by the transmitter to change. As noted before, density needs to be stable for the differential pressure method to be used. This temperature effect can come from several different angles. It can come from the high-side capillary being shorter than the low-side capillary, the high-side and low-side seeing different temperatures, or capillaries being too long. All of these are can be corrected with a well-designed level system. Different Length Capillaries: The industry has found different ways to account for the error generated by this condition. It is caused by the different volumes of fill fluid in each capillary. The longer capillary is affected more than the shorter capillary. This causes an imbalance between the high-side and low-side. How do you fix an imbalance? You balance them. The first method is simple but effective. Simply make both capillaries the same length. This allows each capillary to ‘feel’ the same temperature with the same fill fluid volume, thus balancing the effect. The second method is to keep the different capillary lengths but change the internal diameter of the capillaries to balance the effect of temperature. Both methods are effective. The first method can cost a little more but is easy to engineer. The second method requires a bit of engineering work up front. Differential Temperature: Differential temperature between the two process connections on the tank is common in tank farms. 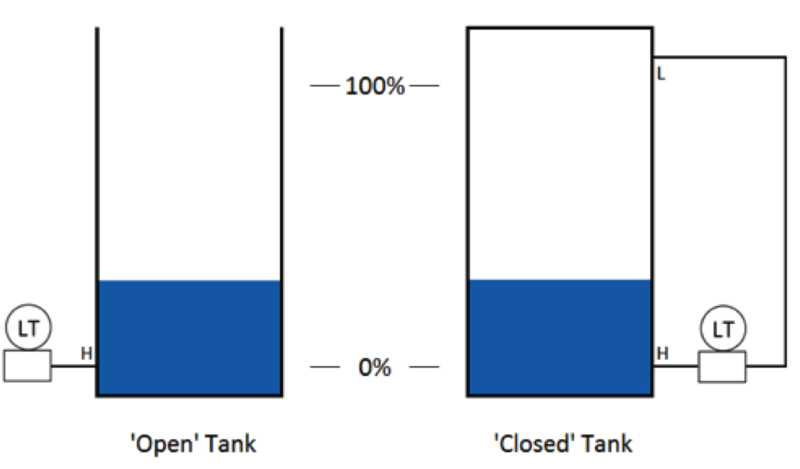 Tank farms are designed to pack as many tanks into as small a footprint as possible. This layout can lead to the transmitters/ high-side process connection/high-side capillary being cast in shadow and the low-side process connection/ low-side capillary being bathed in sunlight. As we all know, there can be a noticeable temperature change between direct sun and shade. Like the solution above, the level measurement system needs to be designed to allow both process connections/capillaries to “feel” the same temperature. The solution is to add a reference capillary to the system. The reference capillary is attached to the low-side and bundled to run along the high-side capillary. This reference capillary ‘transmits’ the temperature of the low-side capillary to the highside capillary. The two capillaries and the reference capillary will reach a temperature equilibrium, eliminating the temperature imbalance. Long Capillaries: The longer the capillaries the more temperature effect the system will experience. Long capillaries are used on tall distillation towers, evaporators, and any tall tank. Although the methods noted above can reduce the effect, there does become a capillary length too long for these methods. The measured level becomes unusable due to the inaccuracies. So, how do you eliminate temperature effects on these applications? Easy- eliminate the capillaries. Several companies on the market offer systems that replace the capillaries with wires. These systems have two different pressure sensors, one located at the high-pressure connection and another at the low-pressure side. The two sensors communicate to each other using electrical wiring. This wiring is not affected by temperature. The sensor located at the high-pressure process connector uses the information from the other sensor to generate an output signal for the level. This system does have drawbacks. The first is price. This system uses two transmitters versus the one transmitter of regular capillary seal system, and so you are looking at double the price. Second, the accuracy is good, but there becomes a point that a well-designed transmitter/capillary/diaphragm seal system will perform better than this system. Temperature can affect the performance of these devices, but a well-designed solution can reduce these effects. Differential pressure measurement tank level is a proven cost-effective method of measurement. This method provides an accurate, reliable level measurement and gets that information to the controller quickly.